The University of Massachusetts Amherst is working in partnership with The Nature Conservancy and state agencies to complete a comprehensive analysis of areas in Massachusetts where connections must be protected and restored to support the Commonwealth's wildlife and biodiversity resources. The Critical Linkages project is developing spatially explicit tools, including models, maps and scenario-testing software, for use in mitigating the impacts of roads and railroads on the environment. We employ a "coarse-filter" approach in our assessment of connectivity; one that does not involve any particular focal species but instead holistically considers ecological systems. Because we were dealing with biodiversity in its broadest sense we distinguished two important scales for assessing connectivity, which we refer to as local and regional scales. Local connectivity refers to the spatial scale at which the dominant organisms interact directly with the landscape via demographic processes such as dispersal and home range movements. Regional connectivity refers to the spatial scale exceeding that in which organisms directly interact with the landscape. This is the scale at which long-term ecological processes such as range expansion/contraction and gene flow occur. Phase I of the Critical Linkages project focused on analyses of local scale connectivity while phase II focuses on assessing connectivity at the regional scale. Phase I of the Critical Linkages project built on the existing Conservation Assessment and Prioritization System (CAPS), a computer model that incorporates biophysical and anthropogenic data to compute an index of ecological integrity (IEI). Because CAPS provides a quantitative assessment for IEI as well as each metric used in ecological integrity models it can be used for comparing various scenarios. Scenario analysis involves running CAPS separately for each scenario, and comparing results to determine the loss (or gain) in IEI or specific metric units. In Phase 1 of the Critical Linkages project we used the scenario testing capabilities of CAPS to assess changes in the connectedness and aquatic connectedness metrics for dam removal, culvert/bridge replacement projects and construction of wildlife passage structures on roads and highways. The connectedness metric is a measure of the degree to which a focal cell is interconnected with other cells in the landscape that are a potential source of individuals or materials that contribute to the long-term ecological integrity of the focal cell. Connectedness is based on a "resistant kernel", introduced by Compton et al. (2007), which is a hybrid between two existing approaches: the standard kernel estimator and least-cost paths based on resistant surfaces. An example of a resistant kernel. Resistant kernels are calculated for each cell of the undeveloped landscape using a resistant surface that is unique for that cell. Connectedness metric for an area on the north shore of Massachusetts. Areas in darker colors are more interconnected with similar areas nearby than those depicted in lighter colors. White areas are developed land. Aquatic connectedness functions much like connectedness but is constrained to move only along the centerlines of streams, rivers, water bodies and wetlands. 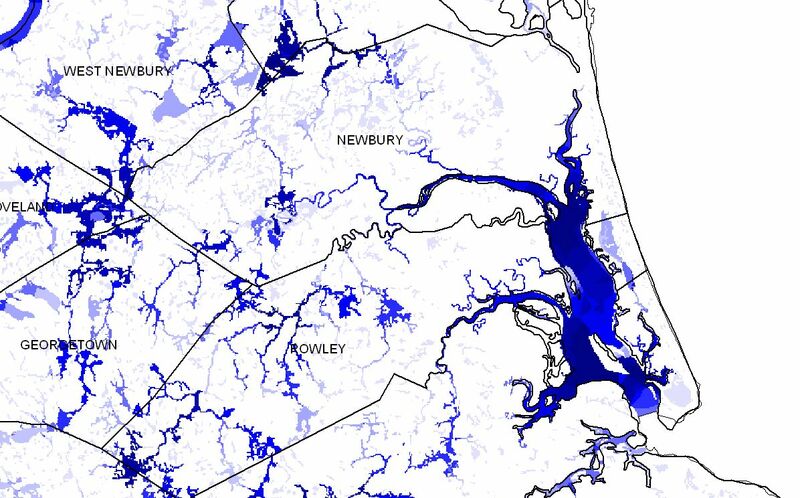 Aquatic connectedness metric for an area on the north shore of Massachusetts. This metric is applied only to wetland and aquatic communities. Areas in darker blue are more interconnected with similar areas nearby than those depicted in lighter color. A baseline assessment of connectedness and aquatic connectedness provided a statewide base scenario for comparison of restoration options. Scenario-testing software was developed to efficiently assess restoration potential for large numbers of possible restoration projects and then applied statewide to dams, road-stream crossings and road/highway segments. Results of these analyses indicate that a relatively small proportion of culvert replacements or dam removals would result in substantial improvements in aquatic connectivity. Results of culvert/bridge replacement scenario analyses for a portion of Massachusetts. Size of the circles is proportional to the change in “aquatic connectedness” that would be achieved by crossing replacement. The larger the circles the greater the improvement in "aquatic connectedness." 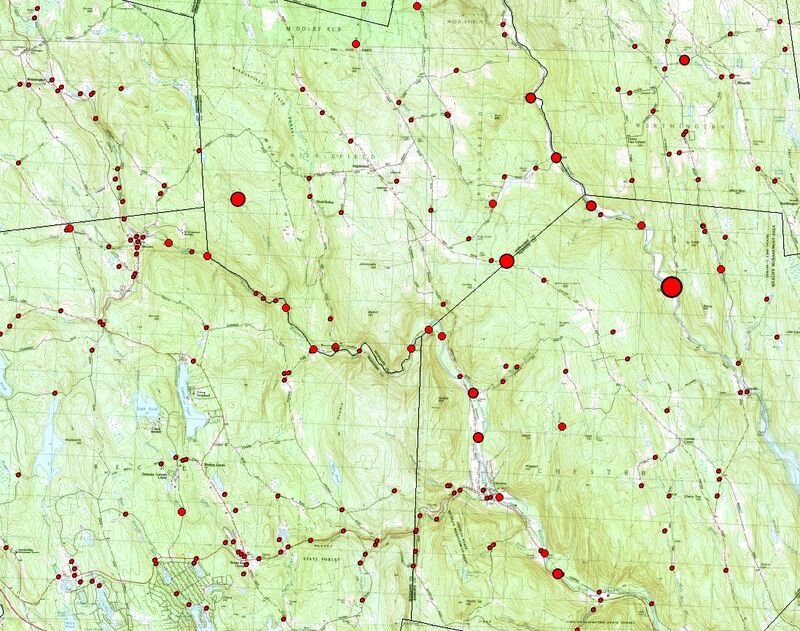 Results of wildlife passage structure scenario analyses for a portion of Massachusetts. The color of the lines is proportional to the change in “connectedness” that would be achieved by the construction of a wildlife passage structure. The darker the color the greater the benefit of using a passage structure at that location. Click here for the Critical Linkages Phase I report. Use links below to download results of Critical Linkages Phase I analyses. In Phase II of the project we will use a hybrid of the resistant kernel estimator approach (used in phase I) and a graph theoretic approach to assess connectivity at a regional scale. We are creating a hybrid system that maintains the spatial realism of the resistant kernel estimator approach and capitalizes on the computational efficiencies of the graph matrix representation. Results of the phase II, regional-scale analysis for Massachusetts will be available in early 2013. Data organization. Critical Linkages results are available for download. This section lists the results and provides links. Data are available in grouped .zip files, listed below. Data formats. All results from Critical Linkages are supplied as point shapefiles. In addition, geoTIFF raster versions of the roads results are available, as they’re sometimes more convenient for viewing. For most uses, IEIdelta is the field of interest. Higher values of IEIdelta indicate locations where a crossing upgrade, dam removal, or installation of a wildlife crossing structure will result in the greatest predicted improvement in ecological integrity. GeoTIFFs. We’ve included raster versions of the IEIdelta values for roads results for forests, formatted as geoTIFFs. Values from the point shapefiles were converted to grids, and expanded with a focal maximum to make roads wider, and thus more visible. These grids have been scaled from 0 to 255, so the numeric values are not meaningful, except as a relative measure. These raster results are included because they display more quickly than the large point shapefiles in GIS software, and display more clearly at some scales. We did this only for forest results, because the results for wetlands & aquatic and for other were driven by a handful of points, resulting in grids with only a few visible cells. These results are best viewed as pointfiles. Included roads. 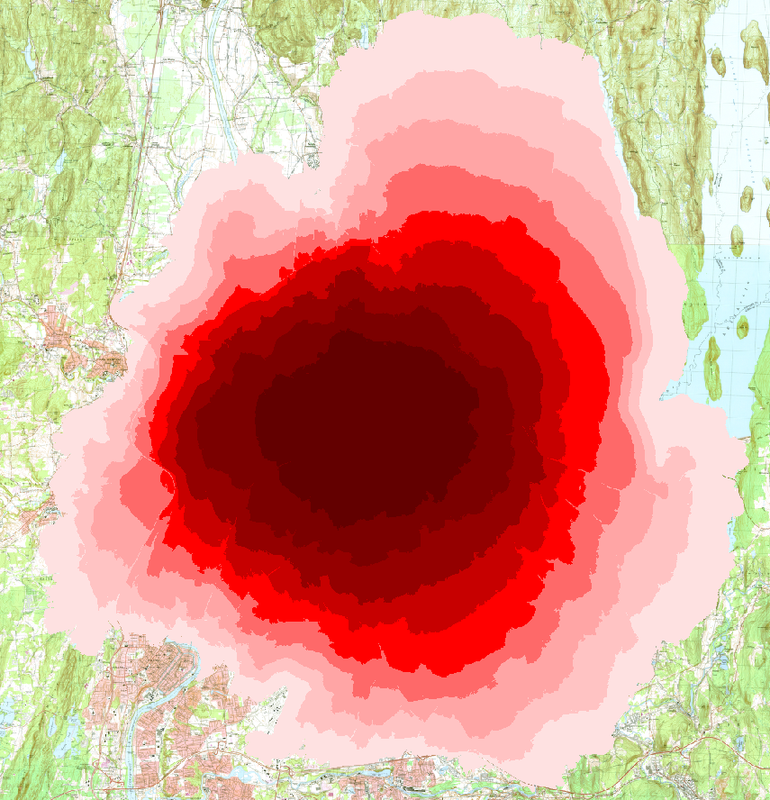 Because of the large number of road cells in Massachusetts (over 3 million 30 m cells) and the computational intensity of the Critical Linkages analysis, we’ve only run the roads analysis for a subset of road cells, representing 8% of road cells in Massachusetts. We excluded roads with traffic rates lower than 1000 cars/day on the assumption that wildlife passage structures would be unlikely to be targeted to smaller roads. We also excluded all road cells that had a mean IEI within a 1 km circle of 0.25, because roads in highly urbanized areas with low surrounding IEI will get low scores from the Critical Linkages analysis. The coordinate reference system for all data is Massachusetts mainland State Plane, NAD83. The Critical Linkages project is funded by and The Nature Conservancy and the Federal Highway Administration via a contract with the Massachusetts Department of Transportation. Information on this web site was prepared in cooperation with the Massachusetts Department of Transportation Office of Transportation Planning and the United States Department of Transportation, Federal Highway Administration. The contents of this report reflect the views of the authors, who are responsible for the facts and the accuracy of the data presented herein. The contents do not necessarily reflect the official view or policies of the Massachusetts Department of Transportation or the Federal Highway Administration. This report does not constitute a standard, specification, or regulation.